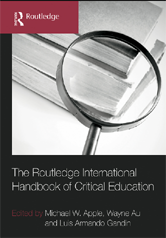 The Routledge International Handbook of Critical Education is the first authoritative reference work to provide an international analysis of the relationship between power, knowledge, education, and schooling. Rather than focusing solely on questions of how we teach efficiently and effectively, contributors to this volume push further to also think critically about education's relationship to economic, political, and cultural power. The various sections of this book integrate into their analyses the conceptual, political, pedagogic, and practical histories, tensions, and resources that have established critical education as one of the most vital and growing movements within the field of education.